Information Technology, (IT) is more than just a solution, it's a relationship. Appalachia Business Communication Corp. is here to provide you with quality business solutions and ongoing support. We strive for a long-term relationship to help your organization grow and ensure that your technology meets the needs of your business. We have the personnel and experience to provide you with enterprise-level service and support. Let us streamline your business operations and communications with a professionally designed, dependable network that improves your work efficiency. Appalachia Business Communication Corp. offers a wide range of network products and services to support all of your company's data systems, including older legacy configurations. If you do not have an IT staff, we can provide you with the resources to build, maintain, upgrade, replace,or repair the hardware and software that make up your network. We can also work with your existing vendors building a relationship with them to provide the most cost-effective support solutions for your company.If you have an IT staff, we can provide products and services to complement them and their job. Use us as an on-demand IT resource. We can handle anything from daily user and system maintenance to specialized turn-key business solutions. We can develop a solution, implement it and then turn over maintenance to your IT staff, or we can provide the ongoing maintenance for you. Appalachia Business Communication Corp.. can support your Local Area Network(LAN) or Wide Area Network (WAN), whether it is 2 offices or 20. We can develop long-term solutions to maximize your dollar and minimize your down-time, using industry standard hardware and software systems. Our technicians, fully equipped and educated, provides complete server and network maintenance, including backup solutions, antivirus, automation, security, and monitoring systems. 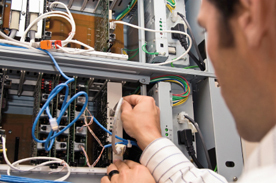 We can also provide documentation and analysis of your network(s). Developing a virtual overall view of your complete network, including servers, printers, workstations, hubs, and so on provides a complete look at your network so that we can develop a plan to provide you with better reliability, performance, security, and redundancy. This type of high level analysis can reveal possible improvements or modifications that would increase efficiencies and/or reduce costs for your company.